Prepare yourself for an amazing fact. Since the end of the 1991 season there have been 40 F1 world championship titles available (20 for drivers and 20 for constructors), and in this time McLaren have only won only four of them. Indeed, of the 20 constructors' titles McLaren in that period have won just one. This clearly isn't good enough for a team of McLaren's resources, heritage and ambition. And while there have indeed been near misses in that time, it was their former team principal Ron Dennis who was prone to say that second place is but the first of the losers. Last year was more of the same for the Woking outfit: while they can console themselves that they were by far Red Bull's (or rather, Sebastian Vettel's) closer challengers, championships were out of their reach, and indeed were never likely. They were compromised by starting the year on the back foot. Pre-season testing was to a large extent a write-off, with their complex and troublesome 'octopus' exhaust system the culprit. They abandoned the idea prior to the opening round, thus saving face, instead going with a system remarkably similar to that on the Red Bull (even Paddy Lowe concedes it was essentially a copy). In the end, they took six fine wins in 2011 and were stronger than Red Bull in some areas, such as switching on their tyres in cool conditions (it's perhaps not coincidence that three of their wins were on cool/damp days), and on occasion they appeared the faster race car (though almost never in qualifying). But the pre-season malarkey rather precluded a serious run at the titles: McLaren were never more than an occasional irritant to Vettel and Red Bull in that sense. There is a view in and around McLaren that with a more solid pre-season they could have been champions last year. This may well be true, but it's worth reflecting that even in the latter part of last year they weren't on the Bulls' pace consistently (though they rarely were too far off). Only in Japan in that period did they clearly beat them. So, what of this year? The MP4-27 raised a few eyebrows at its launch, as it appeared to have shunned radicalism (and not just because of its non-platypus nose) at a time when pushing the boundaries seemed what was required to match Red Bull. Of course, there's only so much that can be told about a car by looking at it (indeed, apparently a lot is different under the skin compared with the MP4-26) and there will be a lot of detail to come. Further, McLaren found out at this point last year that there's such a thing as being too radical, so it's understandable if they wanted to err towards having a solid base this year. But their recent record of being the bridesmaid much more than the bride suggests that at least some inspiration is required from them as well. 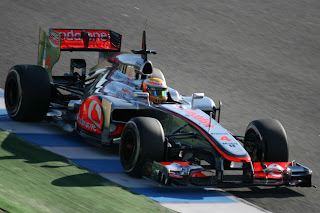 But the MP4-27 has gone well in testing. The noises from drivers and team have been positive (Jenson Button's said that Red Bull won't enjoy the pace advantage at Melbourne this year that they enjoyed 12 months ago), it's run reliably (unlike last year when the machine rarely clocked more than ten laps at a time), and looked about as planted and well-handling as the Red Bull. Lap times have also looked in the Red Bull's ballpark at least, and the car's long run consistency drew admiring comments from Sebastian Vettel. And their definitive Melbourne spec awaits next week. There has been the odd bum note, such as lap time analysis by Gary Anderson and by some others saying the McLaren is behind the Red Bull pace-wise, and even a report that Lewis Hamilton has confided disappointment in the new car with Heikki Kovalainen. Still, most of the mood music from the McLaren camp remains positive. The evidence on balance is that McLaren aren't going to handing anything to Red Bull this year. It was just two years ago that everyone thought Jenson Button had committed career suicide. Then, the new world champion decided to leave the fledgling Mercedes team and join Lewis Hamilton at McLaren. The common perception was that he'd entered the lion's den. What's happened since goes to show that nobody knows anything. Jenson Button starts 2012 with the world at its feet, after a brilliant 2011 of classy, controlled driving, with its fair share of aggression wheel-to-wheel. All of this added up to three wins and second place in the championship table, and his reputation and his driving are now even greater than in his championship year. It also demonstrates the extent that Button's talent was wasted for years in recalcitrant BARs and Hondas. Jenson got his feet under the table at McLaren in double-quick time, and last year he had a car that he was comfortable in and that he'd had input into, and it showed. The beautiful Prost-like smoothness and delicate touch on his tyres remained (vital with the limited-life Pirellis), as did the speed and sixth sense in wet-to-dry conditions, but he found a new level in consistency, speed and assertiveness on race day even when it was bone dry. He now starts 2012 as McLaren's go-to guy to a large extent, an astonishing turnaround. Of course, his team mate's troubled year in 2011 played a part of this, but so very much did Jenson's performances. There is one point of concern for Jenson though heading into 2012. It's no secret that Jenson prefers a understeering set-up as well as that, possibly, his comfort zone in terms of handling is narrower than that of his team mate. Will the passing of aggressive exhaust blowing of diffusers, in harness with degrading Pirelli tyres, take Jenson too far from his comfort zone? Time will tell. Lewis Hamilton's nightmare year in 2011 is well-chronicled, as is speculation on the reasons for it. These need not detain us here, but needless to say that it all makes 2012 a critical year for Lewis Hamilton. The major question is whether Lewis can bounce back and show the sort of performances that do justice to his freakish, instinctive talent and supreme aggression in the overtake, all of which rightly place him firmly in the best of the best in modern F1, or whether his troubles will continue. But surely, so mighty are his abilities, Lewis's resurgence is a matter of when rather than if. And on occasion last year, such as in Australia, China, Spain, Germany and Korea, we saw that the real Lewis still remains. And indeed, there are plenty of reasons to think we'll see the Lewis we know and love back full-time this year. Towards the end of last season he appeared to show an appreciation of where his problems were stemming from and, even better, in Abu Dhabi claimed a race win which demonstrated an understanding of how to prevail in the 'new formula' with the limited resource of the Pirelli tyres. He was aided by Vettel going out early, but it was a drive Seb would have been proud of. Further, he's added Mika Hakkinen's former manager Didier Coton to his camp. A racing man at his side at the races is exactly what the doctor ordered. And, most important of all, the MP4-27 looks quick. Watch out for Lewis in 2012.